I was very excited for fall break which marks the half way point for the semester. This would be a nice break from homework and tests that never seems to end at the School of Mines. 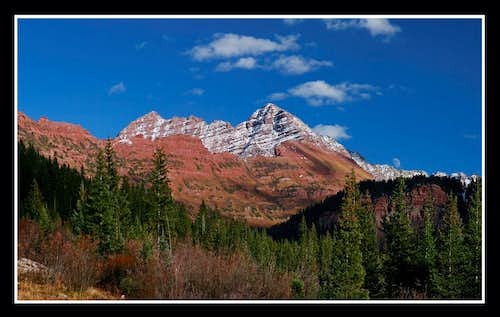 The plan was to hike the 35 mile Maroon Bells circuit 4 pass loop and hopefully get to explore some other areas in some side trips. It was going to be a three night backpack. The main goal for me was too capture some awesome fall photographs and as you will see, I think I did a pretty good job at making that goal a success. 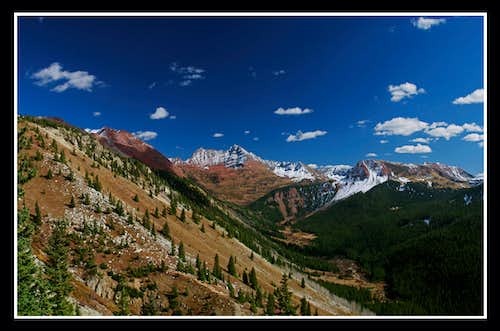 We took the scenic route over Independence Pass as we drove to Aspen, CO from Golden, CO. Upon arriving at Maroon Lake around 3pm we saddled up and started hiking. We quickly passed by the tourist ridden Maroon Lake. Maroon Lake is only very spectacular in the morning anyway so we didn't bother with many photos. Passed by lots of day hikers on our way to Crater Lake, which was nothing more than an area of dirt this late in the season. Completely dry! After a short break at the trail junction we were on our way up to Buckskin Pass. We were making progress very quickly and made it to the top just before sunset. We were able to watch the sunset over the distant Snowmass Mountain and Hagerman Peak. Looking the other way we had some stellar views of Pyramid Peak. After the sun set we started descending as we had to get to Snowmass Lake for camp. Just as the moon rose, I was able to get some very nice alpenglow photos. As the last alpenglow went away I shot this photo. Got to Snowmass Lake and quickly set up the tent and went to bed. We woke up to a beautiful sunrise at Snowmass Lake. Although is was very cold is was still nice as the sun was coming out and it was looking to be a beautiful, crisp fall day. Quickly ate and packed up and started the ascent to Trail Rider Pass. About 400 feet below the pass we hit sunshine and stopped to warm up. 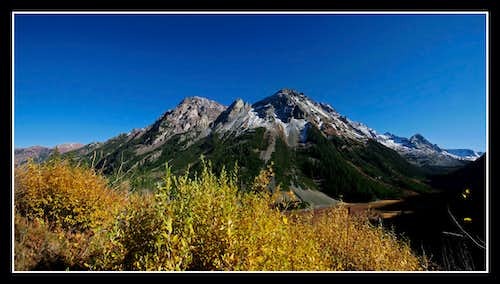 Got superb views of Snowmass Peak towering above us. 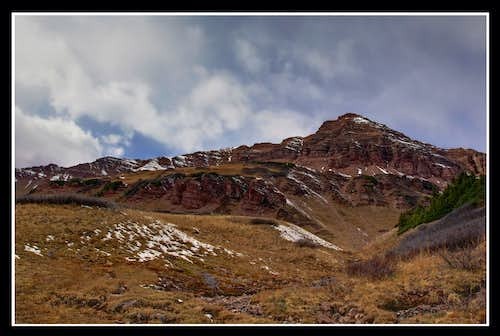 Upon summiting Trail River we were greeted with Panoramic Views. After a nice break we started descending where the spectacular Hagerman Peak came into view. A short bit later we came to a small tarn where we took another break. I decided to take a side trip to Geneva Lake while my partner climbed Hagerman Peak. Got to Geneva Lake and wandered north towards Siberia Lake. 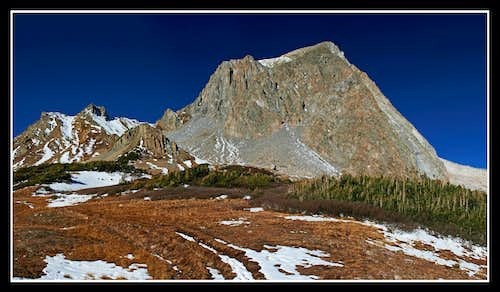 I didn't make it that far but I will be back to get to Siberia Lake and climb Siberia Peak! Met my partner at the trail Junction just below the small tarn and we were on our way to Fravert Basin where we would camp that night. View towards Hagerman and Snowmass from the trail junction. Upon getting into the bottom of Fravert Basin, the moon started to rise and I got some excellent photos of the Maroon Bells as the moon rose. These were also taken right from our camp spot for the night. We got to relax and watch the sunset while having a nice campfire and talking to the other half of our group who met us here. They decided to do the loop in the other direction. Once it got too cold, we went to bed. We woke early and quickly hit the trail to warm up. 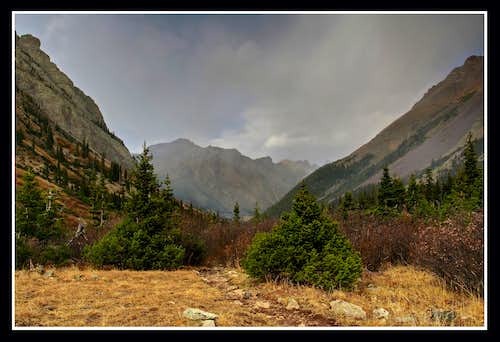 We ascended our way into upper Fravert Basin passing a hunting group who was living at the base of the Coors Waterfall for three weeks and counting. Crossing the stream proved very challenging and we were stuck on the wrong side all the way until we got to the very bottom of the waterfall where I was finally able to design a makeshift bridge to get us across without wading the frigid waters. Once again had great views of Hagerman as we ascended Frigid Air Pass. Upon summiting Frigid Air, the cold winds chased us down in a hurry. Took a very quick side trip to the Hastley Basin Overlook. 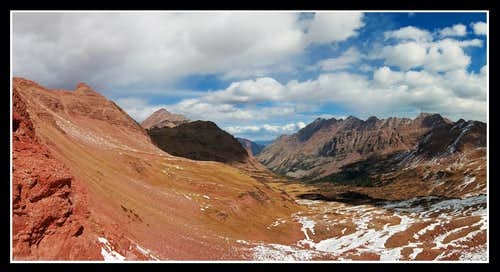 Took my time and enjoyed he hike from Frigid Air to West Maroon Pass. Although the meadows had all died away everything was still so beautiful. 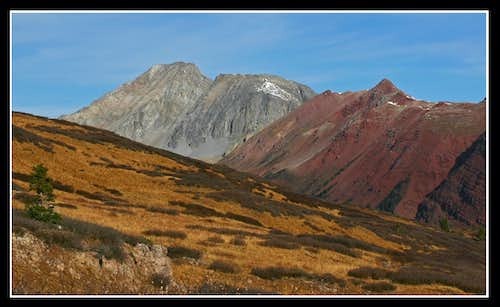 Upon summiting West Maroon Pass a beautiful view of Bellview Mountain and the Pyramids came into view. 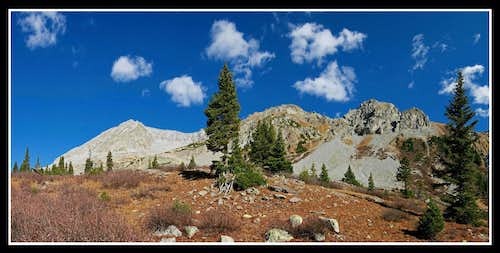 After another break, I descended and explored around in the upper basin while my partner, whose goal was summits instead of photos, climbed Bellview Mountain. Shot this photo of Bellview Mountain as he just summited. I relaxed and took photos as sunbreaks came about. A storm was slowly moving in...one that would mark the end of hiking season. That is why our timing was so perfect...a beautiful weekend that marked the end of hiking season not to mention the lack of people in this usually popular area. When my partner returned from Bellview, we started running down the trail back to Crater Lake. Didn't take long to get back but it also didn't take long for this to fog up. We ate the remainder of our food and camped near Maroon Lake. The other half of our group (and our ride) wasn't coming out until Monday as they spend their last night at Snowmass Lake where we booked it out before the storm came in. We hung around Maroon Lake that evening skipping rocks. 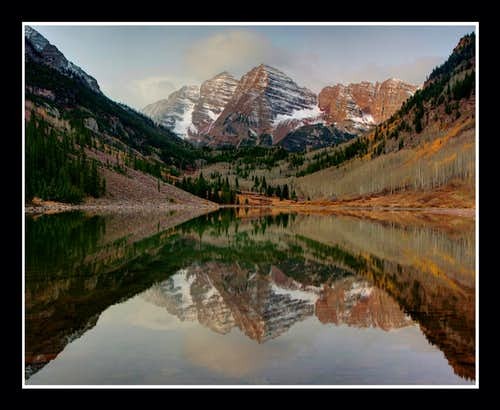 I awoke early to get the famous sunrise shot of the Maroon Bells from Maroon Lake. The winds were calm so I seized the opportunity and ran to the other side of the lake and captured what is now my Summitpost profile photo and probably my best photo I've taken to this date. It was a little cloudy but it was early enough that some of the suns rays poked through. Only 5 minutes after I took this the winds picked up and the reflection was gone. So we had to wait for our rides to get back. They had to hike over Buckskin. Too bad they missed the views due to the clouds and snow but they still had fun. We just hung around the lake all morning until they returned. Didn't see very many tourists either since it was a Monday and cloudy. 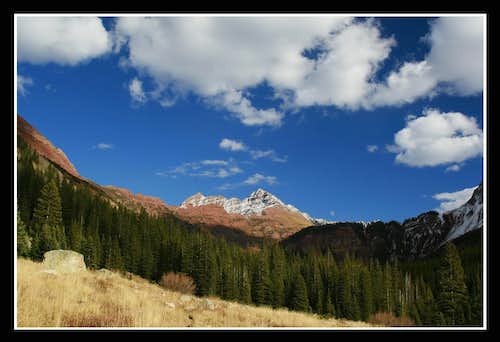 All in all, probably the best set of photos I have taken since I started photography a couple years ago and my favorite Colorado Trip to date.